Hi everyone! 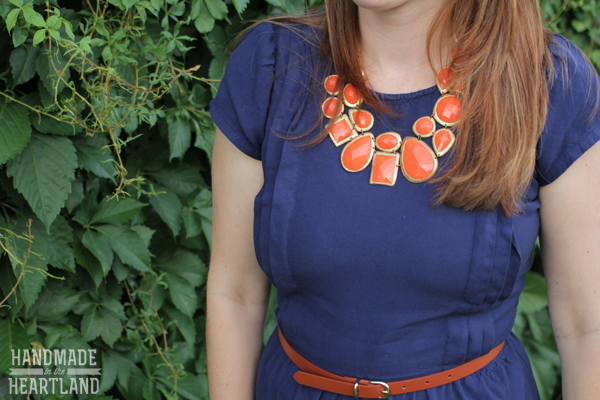 My name is Angela and I’m excited to be a style contributor here at sugarbee crafts. At my blog, Handmade in the Heartland, I show recipes, crafts and DIY projects, parenting tips, home decor ideas, lots of dessert recipes and the occasional fashion post. I’d love for you to pop over and see my blog. 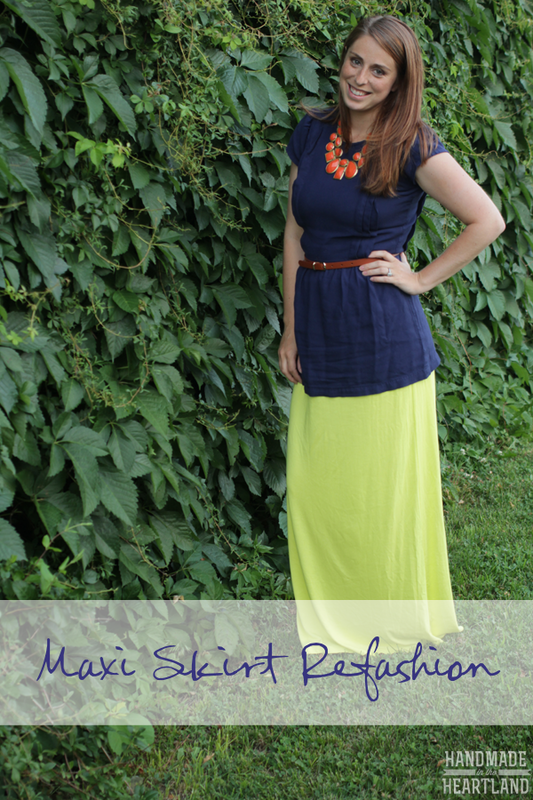 Today I’m excited to share this maxi skirt that I made by refashioning a maxi dress that was on clearance at Target and I had never worn because I didn’t love the top of the dress. At first glance the dress looks cute (thats what I thought) and I think I picked it up for something like $8 on the clearance rack at Target. I kept putting it on and just never loved it so after of a year of it hanging around I finally decided to chop it off and make a maxi skirt. 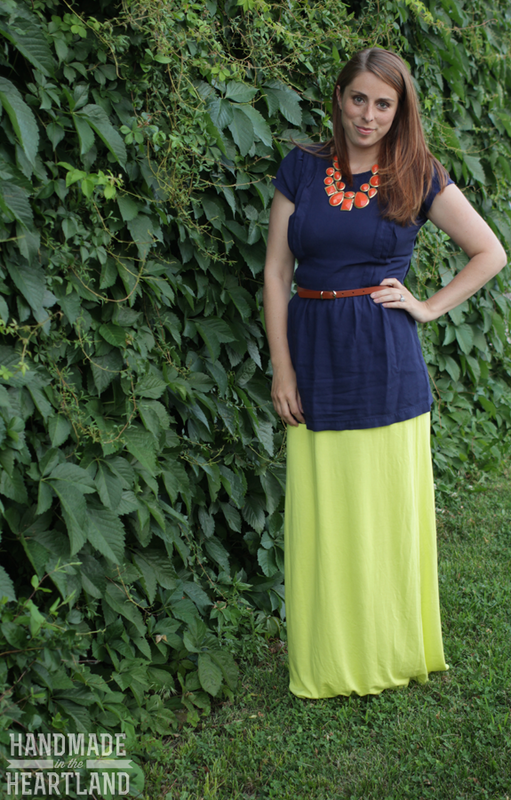 I’ve been totally in to maxi skirts lately. This project took my like 20 minutes. Seriously its so fast. So if you have an old maxi dress you don’t like or if you find one at the thrift store for cheap, making it into a skirt is totally doable! The first step is to measure the width of the waist band and then take that measurement and add 1/2″. Now take that number and measure above the waistband at that measurement and mark all the way around the dress. This is the place you will be cutting your dress off at. 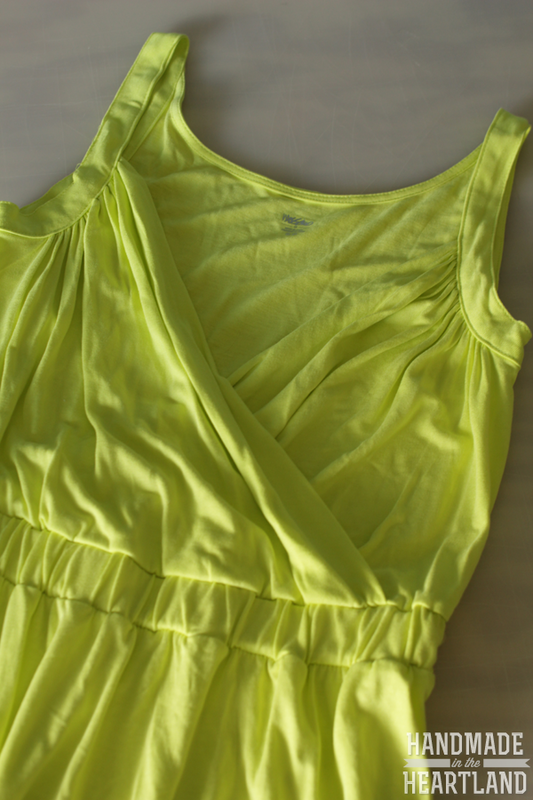 You want enough fabric to fold down behind the waistband on the inside of the dress. After finishing it I was so excited to wear it but then I kept coming up empty trying to pair it with clothes in my closet. Neon yellow-green is kind of a weird color to match with. I finally came up with this combo of the neon yellow with navy, camel (belt & shoes) and orange. Have you done any cool refashions? I’d love to hear in the comments! Remember to stop by Handmade in the Heartland, I have lots of fun 4th of July ideas up right now. WIWW – more of your opinions….